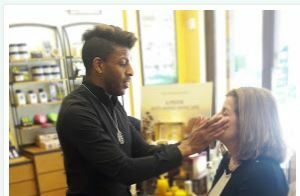 On a beautiful morning, the day before spring, I joined some of the lovely ladies from the Atlanta Food Bloggers’ Society for a day of friendship and pampering. 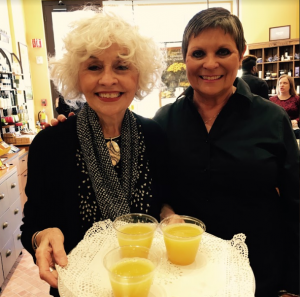 Chef M aka Melissa Pelkey-Hass had coordinated a special time for us complete with massages, mini facials and a brunch tasting. I must admit I had been counting the days to this much needed event! 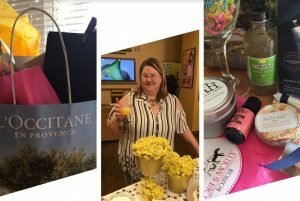 Bloggers & Bubbles: Spring Fling Pampering did indeed begin with bubbles! 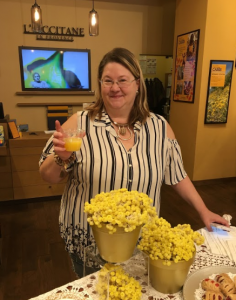 As we entered, the first stop of our adventure, the pretty shop of L’Occitane en Provence at Avalon, we were greeted with bubbles… in refreshing mimosas by the very kind staff. Without a doubt I knew this would be a fun day! Who doesn’t love a little French indulgence? L’Occitane en Provence‘s story began in 1975, with an essential oil made from rosemary from Provence, France. 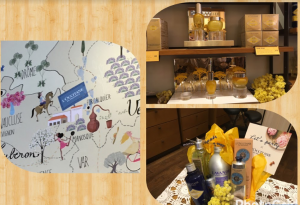 Walking into L’Occitane en Provence is a little like stepping back into the local market where Olivier first began his venture. Today you can find shops in most major cities all over the globe, as well as in many airports. 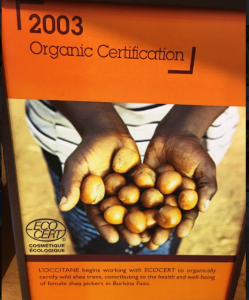 L’Occitane’s company values are reflected through out its store. 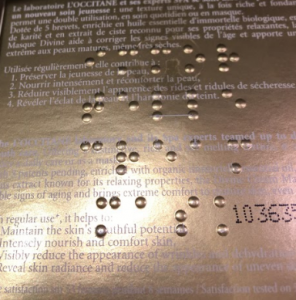 The result is its story builds trust with its customers from understanding how ingredients are sourced to showing that Braille is added to its labels. I love how little signs through out the store tell about the brand. These details build an authentic foundation for a much admired and appreciated brand that includes a full line of natural skin care products. Did I mention they all smell Amazing! Throughout our visit we were treated to beautiful and relaxing harp music from Julie Koenig. My morning began with a most wonderful chair massage and a mini facial. 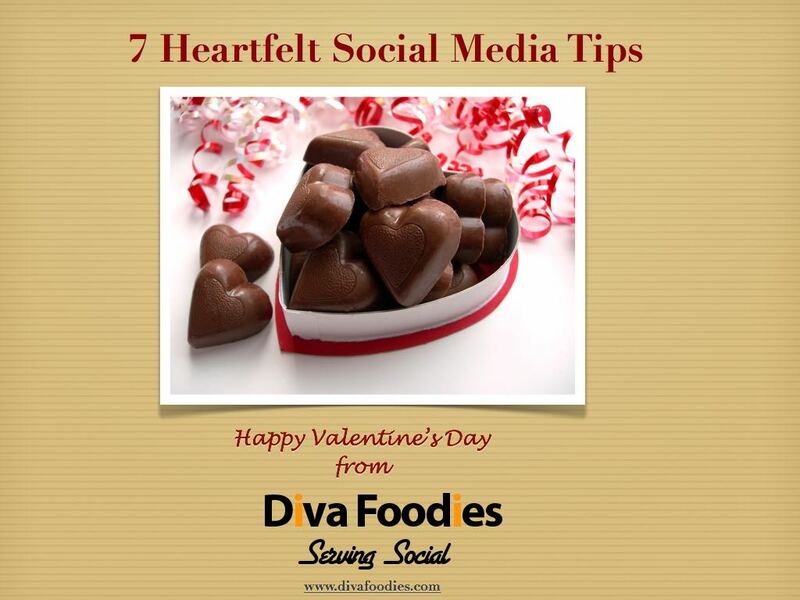 Photo borrowed from Happily Edible After. Thanks Shannon! Surpr sing how feeling oh so relaxed and oh so pampered works up an appetite! We made our way to historic downtown Alpharetta for brunch. 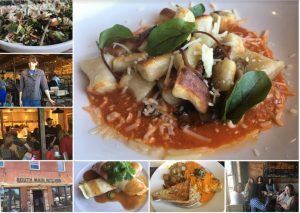 Two restaurants hosted us South Main Kitchen and Butcher and Brew. 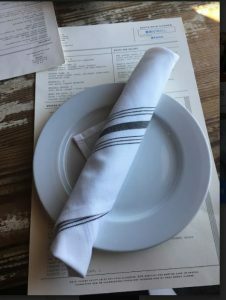 I happily enjoyed my brunch at South Main Kitchen. Although the restaurant’s decor is casual the food was surprsingly more sophisticated than I anticpated. Our brunch tasting began with not one but two unique salads. 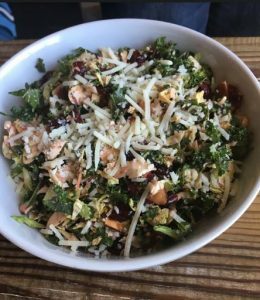 The Kale & Brussel Sprouts Salad was dressed with the most delicious ginger and blood orange type of vinaigrette. The dried cranberries added a tart sweetness and the almonds a nice crunch. Shhh! I maybe the only person in America who is not a fan of kale but I Loved this salad! The feta cheese sprinkled on the Quinoa Salad added a needed kick to what might have been an ordinary dish. Sometimes it’s the unexcepted that makes the difference. Very Nice. We were then treated to a couple of Starters: Parmesan Gnocchi and Brussel Sprouts. 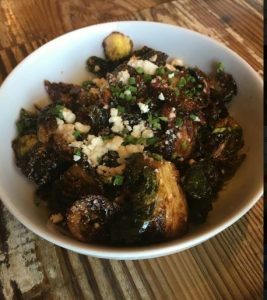 It was quite evident that Chef Christy Stone knows her way around Brussel Sprouts! This Starter dish was every bit as yummy as the brussel sprout salad. The ginger + blood orange vinagrette worked really well here too. The saltiness from the feta and salty-crunch from the bacon made this Amazing and I understand this is one of South Main Kitchen’s most asked for dishes. Not a surprise. Next came the entrees! Short Rib Crepes, Garden Omelette and Biscuit and Gravy. 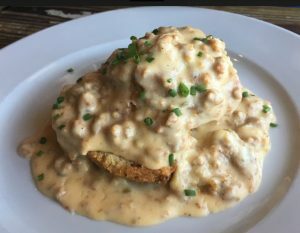 Growing up in New England the concept of a biscuit served with gravy is well, a bit odd to me. However…. when the spicy sausage was combined with the flaky biscuit and yes (!) the gravy I definately got why my Southern friends call this dish comfort food! If you’re in the mood for something a little lighter the Garden Omelette filled with veggies like cauliflower, tomato. arugula, mushrooms, pecorino cheese with red pepper creme sauce is definately a good option. The coffee was great too… most important especially at brunch. A big shout out to our server, the staff and Chef Christy Stone who came out to greet us. Always a treat to meet the chef! Loved this sign that is displayed in South Main Kitchen’s dining area. 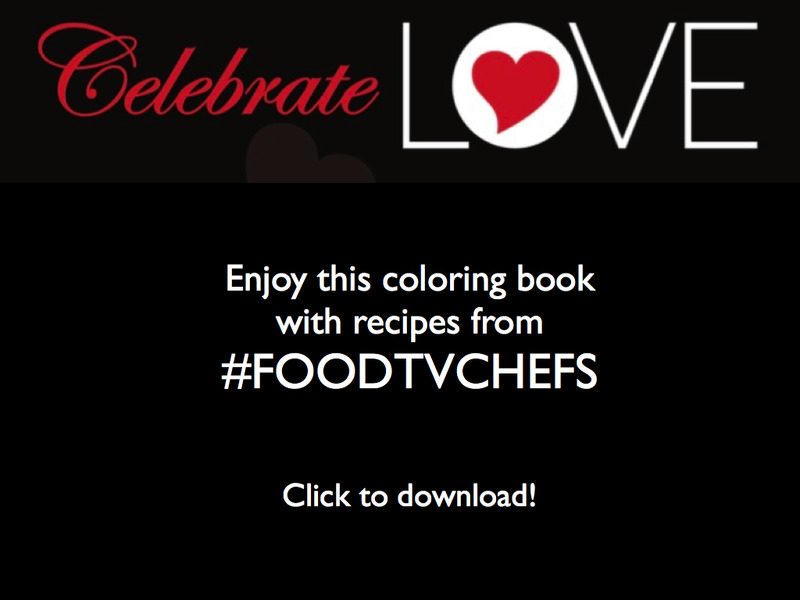 Chef M had one more surprise for us! We all went home with a fun swag bag with presents from L’Occitane en Provence, Stirrings Cocktail Mixers, Scout & Molly’s. Love presents! Thank you Chef M for a very special day! 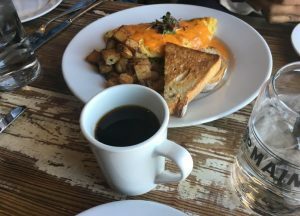 Disclaimer: The invitation to attend this event was part of a blogger influencer event hosted by Chef Melissa Pelkey-Hass. The meal and event activities were complementary. I received no monetary compensation. All opinions are those of the author. What a perfect way to celebrate spring! Yes, Polli it was wonderful! Chef M did a fabulous job coordinating a fun day.